The Dean and Chapter of Winchester Cathedral offer the curates of Winchester Diocese the wonderful opportunity of preaching at Cathedral Evensong towards the end of the curacy. It’s a daunting thing, but a huge privilege, and today it was my turn. Normally, this would be undertaken in ‘choir dress’, but since tonight was the first Evensong of the Feast of St. Philip and St. James tomorrow, they got some of their gorgeous robes out and of course, I had to fit in. It is all too common in the media frenzied world we live in, that when some key moment in history is being played out, like the announcement of a General Election, those who live by a well-poised microphone, seek an interview with the key players. Sound-bites are demanded to enable us who feed on the all-consuming media-machine, to discern the so-called truth. The media wants to know ‘who?’, and ‘what?’, and ‘why?’, so they can be first with the relevant ‘scoop’, grab reflections from the most note-worthy analysts, and massage our minds with ‘breaking news’. The little group of Greeks who plagued the most approachable of Jesus’ followers for an interview with the wandering rabbi who’d just been greeted in Jerusalem like a conquering hero, could well have been the early equivalent of today’s political editors. One might imagine that the ‘who’, ‘what’ and ‘why’ of a political leader on a donkey would make good copy! However, despite the tendency of those who saw their world in ruins and yearned for freedom from the tyranny of occupation to wish it otherwise, Jesus was no conquering hero, or political leader. He was however someone who sensed the change in the tide, as the welcoming Jews who were fascinated by the miracle of Lazarus’s resurrection fell away at the sound of Pharisaical sarcasm, and were replaced by these curious Greeks. Jesus, the Son of Man, knew that what lay next for him was as much of consequence for these gentiles as for his fellow Jews; so they might as well get their click-bait sound-bite, then they could go away and analyse it as the events that revealed its truth unfolded in the week to come. It obviously worked, otherwise we wouldn’t still be reading it today! “The hour has come…” sounds like political rhetoric worthy of Winston Churchill; less so a discourse on the germination of a grain of wheat. 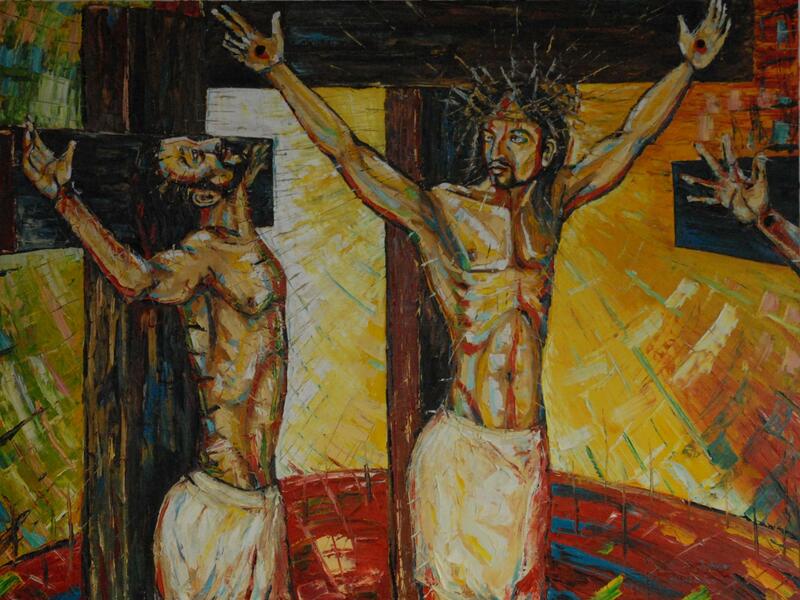 Yet it is that image that holds the kernel of the message that Christ’s impending death and resurrection represented. The pun is intended, for the kernel of a seed is packed with energy and the building blocks like starch, protein and fat, which allow it to grow through the soil until it reaches the sunlight to make its own food and reproduce. Christ would die to bear much fruit; the fruit of the Kingdom of God that would form from a single, sacrificed grain of hope. For the exiled people of Israel, reading in Babylon the words prophesied by Isaiah decades earlier, the seeds of their hope lay in the traditions of their faith. Their complaint is that God is ignoring the right of his people to see in their generation the fulfilment of the promises made to the patriarchs. They dimly remember that they were called to be a great nation, as numerous as the dust of the earth (Gen 12:2-3), and a blessing to all peoples (Gen 28:13-15). Yet defeat and deportation have left them too numb to grasp the truth that the power of their creator God extends from their past, through this present suffering, well into the future, in which lies the fulfilment of those promises. Like the writer of Psalm 25, they are asked to wait for the Lord, not in the insidious doubt that breeds despair, but in the sort of confident expectation that breeds hope. The exiles in Babylon would eventually find that hope in the restoration of their lands and temple. But their future leaders would again become so hidebound to an understanding of God which they created in their own flawed image, that they would fail to recognise the means by which they would indeed become a blessing to all peoples, and so they crucified their flawless Saviour. It was to this sacrifice that Jesus refers in his response to the eager plea of the Greeks for an interview. It would in fact be they who, at Pentecost and because of his resurrection, would be among the peoples to whom God’s new covenant with all people would be inaugurated. How much are we like the Pharisees, forming our image of God on the basis of our own flaws? How much are we like the exiles in Babylon, prey to insidious doubts that God perhaps has forgotten us? If it is not us for whom we are concerned, perhaps it is the defeated souls who wash up on the shores of the wealthy west, almost as devoid of hope as they are of the money that bought them a dangerous passage, powerless to battle the bureaucracy of borders? Or perhaps it is the young for whom we are concerned; especially those faint and weary from the constant expectation that everyone can be above average, who fall exhausted into an epidemic of depression? Have we not known? Have we not heard? That our faith is in the everlastingly faithful creator who has revealed himself to us in Jesus? That it is we who are called to be the grains of wheat who by sacrificing ourselves, our time, our effort, our money, even our political differences, on behalf of others, will be serving Jesus? The chances are we do know, and we have heard, but making a life of sacrifice and service a reality is much harder than perhaps we would wish. We yearn to change a world that at times seems in ruins, and free it from the tyranny of injustice, yet the work can seem fruitless. Subsuming our own needs and desires into the sometimes unpopular, awkward, perhaps even isolating work of serving others, is tough. Which is why we too need to catch hold of more than the sound-bites of Jesus’ ministry, and pick up again the seed of hope he holds for each of us. Christ’s death and resurrection, in obedience to his Father’s will, gives everyone the opportunity for a relationship with God that guarantees his presence with us through the power of the Holy Spirit. However much of a struggle it is, if we have faith in Jesus and follow his example, we will find that he is with us. If we wait in confident expectation of his presence among the tasks we do at his command, then we will find our strength renewed for the work we do to serve others, and our lives bearing much fruit in the name of Jesus Christ, our Lord. We give thanks to you our risen Lord, that in your death and resurrection you offer all people the seed of hope. Help us to be this seed, and growing through acts of love, sacrifice and service, bear the fruit of your Kingdom. Faithful creator, incarnate through the power of the Holy Spirit, inspire in us the courage to act responsibly towards your creation, that we might not remove the seeds of hope for future generations through our careless abuse of the world’s resources. Remembering that in your flawless humility you suffered for us, Jesus, work in the words, actions and policies of our leaders and media to offer a fresh vision of truth, justice and the renewal of hope for all people. We remember from our Diocesan cycle of prayer those who are refugees and asylum seekers, and all who find themselves struggling for hope in the face of bureaucracy, injustice and exploitation. Loving Jesus, give us the courage to work for the right of all people to safety, security and freedom, as we serve others in your name. Lord Jesus, we know ourselves to be fragile, and many for whom we care to be faint and weary from the cares the world places on them. We remember in a moment of silence those known to us who need to know your comfort, healing, presence and peace…………… and strengthen those who share their own journey to wholeness in support of others. and the fellowship of the Holy Spirit be with us all, evermore. Amen. 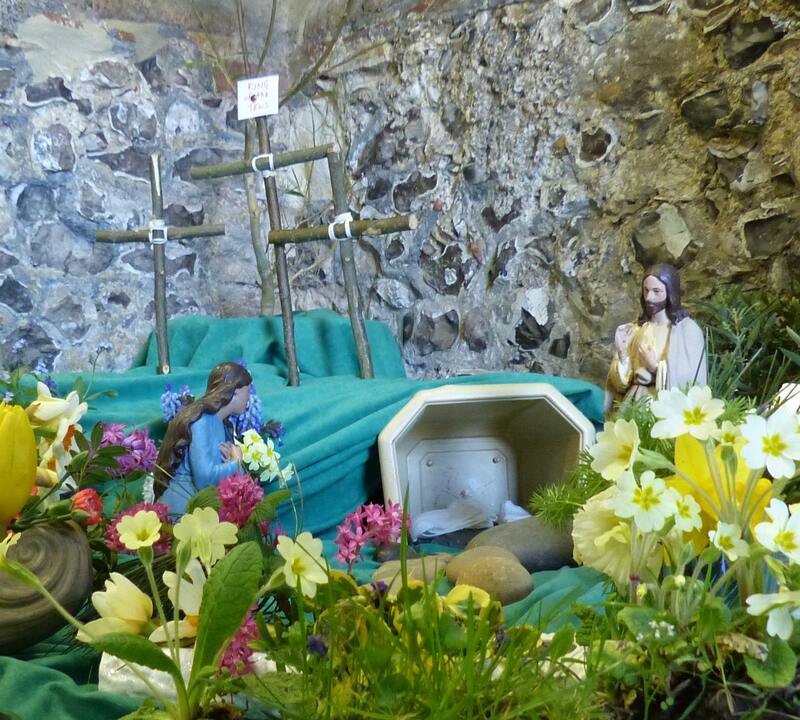 Easter garden at St. Mary’s Old Basing and Lychpit 2015 – interestingly our model of Mary of Magdala has her in a blue robe, not a red one. Mary of Magdala, Mary Magdalene. The woman we remember today has had so much imposed upon her since she was first captured for posterity in the pages of scripture that it is difficult to untangle the things that we really know of her, from the the things that have been assumed, conflated with others; impressions and fables captured in art and in literature, both learned and less so. I make no pretence to be doing anything other than adding to the layers of uses to which her character, her actions and her faith have been put, but I do so because her story is one that brings us within touching distance of Jesus, a fact that I think lies at the heart of her universal appeal to both the Christian and secular imagination down the centuries. We can be pretty sure that this Mary was an independent woman from the lakeside town of Magdala, on the Sea of Galilee. Why independent? Well because in scripture she takes her name from the place, rather than from her nearest male relative (Hebblethwaite, p116-7) as is otherwise the case in the Gospel’s and context of the time. The myth of her sinful past may well rest on the absence of these reassuring family ties, and, the layer of assumption that her closest relationship with a man appears to have been with Jesus (Hebblethwaite, p116-7), has no doubt contributed to more romantic notions than scripture actually provides evidence for. We can be pretty sure that despite the red dress of so many artistic impressions of this woman, Mary Magdalene was not a prostitute. Too long has her story been conflated with those of the sinner who touches Jesus in Luke 7:39 (who was not necessarily a woman of easy virtue herself, if our modern understanding of language is accurate), and Mary of Bethany who anoints Jesus in John 12 whose character has likewise been prostituted (Hebblethwaite, p119). Scripture does testify, more than once, to the fact that Mary of Magdala had mental health issues when she first encountered Jesus, for her seven demons are referred to in Luke 8:2 and Mark 16:9 (Hebblethwaite, p120). The number seven probably only suggests the severity of her illness, not its nature and cause, which have themselves become a rich source for the imagination of more modern writers and theologians, wanting to encourage a more positive pastoral attitude to mental health care through the example of Jesus’ ministry to her. And yet scripture gives us no detail of this healing encounter with our Lord, perhaps because as some have suggested it took place over the months and years of their friendship during Jesus’ travels, rather than in one single, miraculous encounter (Hebblethwaite, p120). Our chief evidence for the action, character and ministry of Mary Magdalene is in the scripture that forms our Gospel on this her Feast Day. Here, is a woman who (possibly with others) wanted to give the body of the crucified teacher the reverence it was due, to fill the void which being witness to his murder had created in her life. But the emptiness she initially encounters is even greater than anticipated, as she reaches a tomb devoid of the healing (John 20:1) that a graveside watch can bring. As was the case at the crucifixion, once the initial encounter with the confusion of Christ’s resurrection is made, the men who perhaps she hoped might support her in their shared perplexity, vanish. So she weeps alone with a grief that soaks through the layers of her life as well as her clothes. It has been said that ‘maybe you can only see angels through tears’ (Wright, p146) and I know that’s been true for me: Mary seems suddenly devoid of hope because all she thought she understood has been taken away, but the presence of angels creates the questioning that cuts through her desolation. Possibly the most consistent point of reflection through all the layers of Magdalene myths is the scriptural evidence that it is not only angels she sees, but the risen Lord himself whom she finally encounters and recognises by the use of her name: Mary….. As she reaches out to cling to the one that brought her healing, she comes up against another stage in that very process, one that does not rebuff, but invites her to re-enter the independent life with which she first encountered Jesus, but now without the luggage of illness with which she had previously been encumbered. As the Apostle to the Apostles (Wright, p147), sent to share the good news of the reality of the resurrected Christ with those who had run too soon to witness it themselves, Mary of Magdala finally receives the freedom (inspired by Mann, p55) that comes with true healing and renewed purpose. I wonder how much the layers of people’s suppositions about our histories and our characters weigh upon our lives? People think they know something about us when they glimpse a few simple facts that might include our marital status (past or present), a bereavement or an illness. 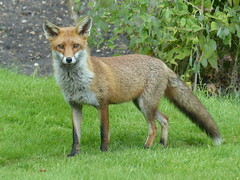 Likewise, we may grudgingly recognise that in the light of the snapshots we see of others’ lives week by week, whether in their homes, the shops or in the national headlines, we impose our own layers of conjecture as to how they understand themselves, their spiritual journeys and their encounters with God. Like Mary Magdalene, what we need to encounter for ourselves is not only the healing that comes from being a follower of Christ – happy to stay on the road with him week by week and willing to stand at the cross of his suffering with others – but also to encounter the emptiness of those places and relationships where initially he seems absent. We have to trust Jesus to reveal himself to others, not only in those places where we except him, like here in a much-beloved church, but in the places where perhaps we have given up looking for him. On finding the place where they expected to find Jesus, many have run away, because they were looking for someone who had died. The freedom of the resurrection, the hope that Mary of Magdala was the first understand, was that sometimes it is only when we stop and sit with weeping with our broken expectations, that we encounter the living Christ. Only in that encounter, wherever or in whoever it is formed, will we know not only freedom, but the purpose to which Jesus is sending us back into the world in which he calls us to live day by day. The Christian women of Old Basing decided some months ago that whilst the women of The Bahama’s had wanted an interactive reflection on John 13:1-17 (something of which I was unaware at the time), they would prefer to have the more usual speaker for this years World Day of Prayer, and asked me to speak. So today, I shared with them a few thoughts,… and gleaned some of theirs. The jug, bowl and towel that St. Peter’s Yateley gave me as a leaving gift as a symbol of servanthood. 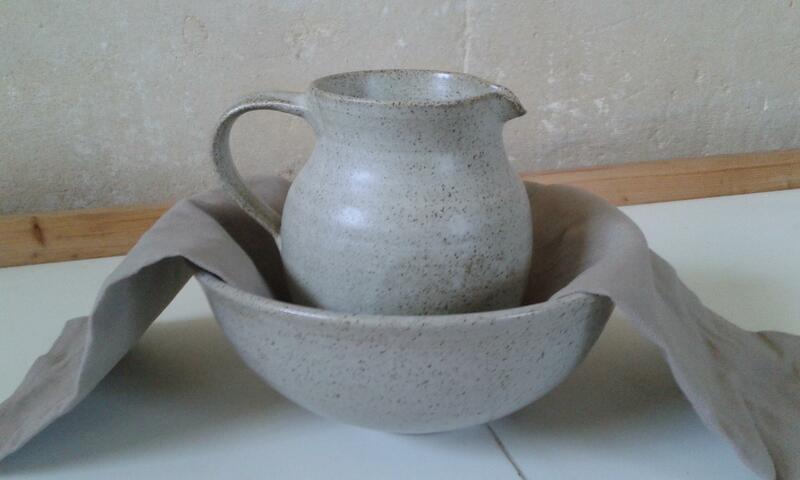 This [jug and bowl] set, complete with small, matching towel, was a gift from my sending parish last Pentecost, when as a family we left in preparation for my ordination and coming here. It was very specifically given as a sign of the service I would be offering to the communities I will work in as an ordained minister, not just in my diaconate year, but always. The reference to the passage that is our Biblical focus today, is unmissable. Jesus lays aside his garments and takes up a [towel] or apron, kneeling at people’s feet, as a slave would. He, the once and for all Messiah, [pours water] onto soiled, dirty, feet, making them clean. The symbolism is spelled out clearly in the scripture – as Jesus has served his disciples, has become a slave to their needs, so they should go and do likewise! The connection to the slavery and service offered by the ancestors of many in the Bahama’s is also obvious. Equally, many of us have given much of our lives to serving others – service perhaps of our country, almost certainly of our church; service to various charities, to neighbours and friends in crisis; we will have served our family with an outpouring of love wherever possible, whether it’s been reciprocated or not. Those acts of service hopefully continue, and it is through them that we rightly offer spaces for God’s blessing of the lives of others. So, as we re-visit this probably familiar passage, what more does Jesus want of us? Jesus was preparing to lay aside not just a few moments of his life in the service of others, nor the length of natural life in enforced slavery as did so many during the height of the slave trade, and sadly still today in some places of the world. We know Jesus gave up life itself, willingly, freely, as a sacrifice for the whole of God’s creation. It may have been the ultimate freely given gift of grace, but it was given with the anguish of God’s broken heart as well as a broken body. There was pain in these Jesus’s actions among friends in the Upper Room knowing that one would betray him, the anguish of his submission to his Father in the Garden of Gethsemane, in which he also knew his Fathers’ anguish that it had to be this way, and then heaped on this, the physical suffering of the cross. In it all Jesus was conscious of his divine origin and destination, and that this was the most critical task laid on his place in this world by God. 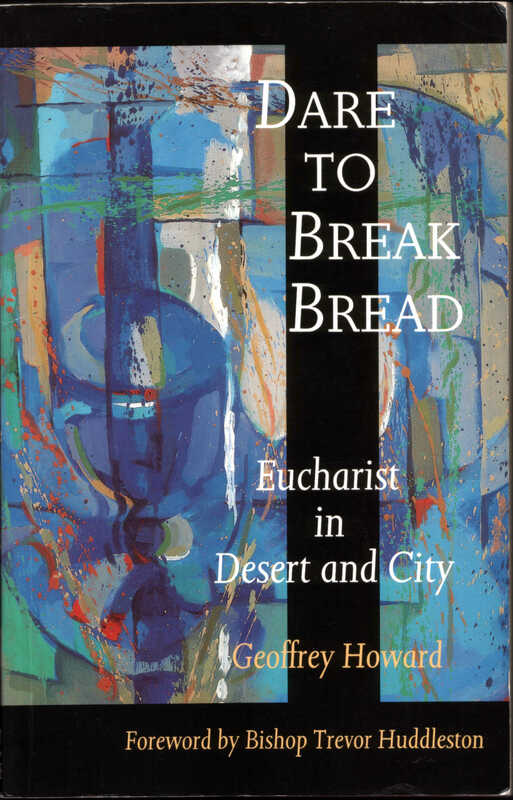 When he bled on the cross – the action we remember in the Eucharist alongside his other command to ‘do likewise’ by sharing in bread and wine – When he bled on the cross, it was a cleansing from sin and our tendency to ‘fall short of the mark’ as Fr Alec put it in this months “Basinga”. It was the ultimate act of love of the Son of God for every other child of God, then and now. Christ’s was a sacrifice for the future of God’s Kingdom, a drawing not just of his own generation into relationship with God, but the ‘supreme work’, a once and for all sacrifice so that all people in all places of the world, from the Bahama’s to Old Basing, might recognise God’s love for them, acknowledge their shared humanity in Christ’s image, and proclaim it to each forthcoming generation. ‘Christ’s blood’ poured out to cleanse us. So let us change the footwashing image slightly. Let us take a more ordinary jug and bowl, one that we might use daily to prepare food rather than place on the mantle-piece, and think for a moment how it might be if we poured [our blood*] out over one another. Our blood is our life, we can’t carry on without it, we lose too much of it and we pass out. Healthy blood also contains cleansing properties, fighting off the bacteria of those bugs and diseases that can cause us harm. The DNA markers that we find in our blood, can be found in future generations of our family, however distant, to mark them out as having a shared heritage. Our blood can on occasion be donated to save the lives of others. Slaves who died, did not do so willingly as Jesus did. They died because of people’s inhumanity to their fellow humans, a lack of recognition as to a shared place in God’s creation. Sacrifice is much more about freely giving up something important to us, something we hold dear, more-so than straightforward acts of service where we might enjoy the effort and be happy to give up the time involved. Sacrifices include those things where we may be less likely to see the benefits of in the lives of others, or within our own lifetime – they are an act of faith, designed to give life, focused on the future. We may feel that we have already made sacrifices in our lives. Perhaps we have given up a career for our family, or some of our family life to take forward a career or calling. But our focus this morning, and this passage in particular, asks us how radical and sacrificial can our love for those around us be today, and in every future day? What can we sacrifice, from which we may not gain any benefit but which would enable others to more fully experience the love and forgiveness of Jesus? How do we pass on our Christian heritage, including that of this Women’s World Day of Prayer, pouring out our faith-blood like we might donate our actual blood and DNA, to future generations? I’m going to invite you now, in a few moments of silence, to consider those questions. But I don’t want you take away your answers in silence. It would be lovely if we all knew what they were. So, whilst we are having our refreshments after the service, if I may, I would like to interrupt us briefly**, so that we can talk about what sort of sacrifices we feel we are able to make. Whether or not they are directly related to Women’s World Day of Prayer, we can think about how we might make them happen, because Jesus wants us to follow in his footsteps, to “DO as he has done to us”! 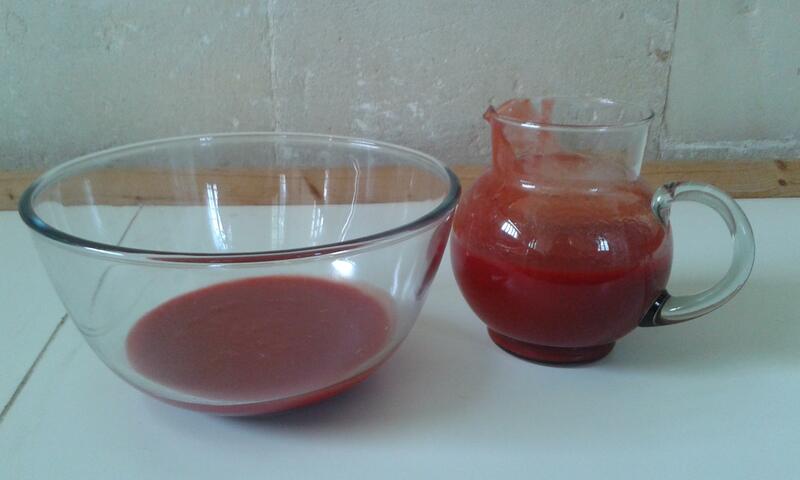 * After a Twitter conversation, the ‘blood’ was cheap tomato ketchup, watered down a bit, with added red food colouring. I was told it was reasonably authentic! 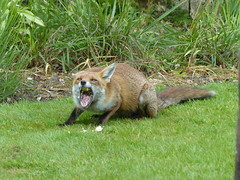 ** I carried out my threat to interrupt them. The feedback centred around the need for health (excercise specifically I think) to be more closely associated with social welfare, and the levels of isolation experienced in the community, I think particularly by elderly (who were well represented in the congregation). I challenged them to have done something as a community of Christian’s about one of these issues by the time they gather for next years WWDP. What is ‘sacred’ in Christianity? It may surprise some to know that this week I started ordination training by focusing on other important religions in the world today, and how Christians engage theologically with them. From a practical point of view this is partly because I’m doing two years of study, and missing out some of the initial modules that some of my colleagues are studying because I have hopefully covered some of the material in Reader Training. “Inter-faith Theology” is a second year course on the Oxford Ministry Course, and one that because of my mixed-mode MA modules I won’t be required to submit a portfolio for. I have never lived in a particularly multi-faith community, but as I boot up my rusty brain, I thought I’d share a few thoughts about my own faith, sparked by a recent article in the Independent that I was pointed to by a tweet from Fr Richard that said “really important stuff on the difference between Islamic and Christian views of revelation.” Except for me it wasn’t differences in our views of revelation, but differences in our views of what is sacred. Islam treats its sacred text as outside the pressures of history… The Bible is human as well as sacred. For me, the Biblical narrative is about real events and people, but they are related by humans at specific points in history, who have viewed those events through particular lenses of culture, ethnicity and language. Some Old Testament scripture was written to describe events that occurred thousands or millions of years ago (depending on your views on creation), significantly after the events they try to describe or interpret. As Christian’s we inherited these from our Jewish forbears. Even some of the ‘stories’ in New Testament scripture, including the Gospels, would have relied initially on word-of-mouth to transmit them. Others were written to specific communities or people with particular problems and needs (like the Corinthians). So my faith based on Biblical descriptions of what others like Thomas saw for themselves, and declare with them that Jesus is ‘My Lord and my God’ (John 20:28). But none of this makes scripture ‘sacred’ as far as I understand the term. If something is ‘sacred’, it pertains to the divine and is exclusively devoted or dedicated to that deity – according to the dictionary at least. Obviously I would agree that the Bible is about God, and his continuing revelation of himself to humanity. But whereas both the Qur’an and the prophet Mohammed (pbuh) appear to be sacred to Muslims to the extent that they cannot be critiqued (and I’m very willing to stand corrected on that), I don’t regard the Bible as sacred to the extent that we should not engage with it using the full range of our intellectual abilities. However, the sort of speculation to which Ms O’Grady refers, and which is also reflected on here from the viewpoint of a feminist theologian, doesn’t seem to me to have any bearing on the Biblical narrative. The scriptural record does not include details of Jesus’ marital status, as far as I am aware, because it is not pertinent to the Christian faith. I believe God created Jesus as without sin, but does a possible marriage change this? No, I don’t think it does. This I suspect is why I don’t feel threatened by a papyrus that may, or may not, change our understanding of Jesus earthly life. What is important about who Jesus was, is never-changing, not ‘ever-changing’ as Ms O’Grady suggests. So, the celibacy or otherwise of Christ, has no influence on my faith in the Jesus revealed through the writings of the New Testament as crucified and risen. Yet, is even he, really sacred? What I’m wondering is whether the Christian understanding of Jesus as the means of God’s grace, in fact means that nothing is sacred, except ourselves! Because as Christian’s we are the ones that should be exclusively dedicated to Jesus as our response to God’s love and forgiveness. I suppose in a spiritual way our identity in Christ gives us a sacred nature which is sacrificial rather than untouchable and out of reach, echoing the life, death and resurrection of Christ. So, perhaps that’s it. What is sacred in Christianity is OUR response to Christ, his death and resurrection, as testified to in the New Testament, and as the means of our relationship with God.